Trusmadi is the second highest peak in both the island of Borneo and the country of Malaysia (after Kinabalu). It offers a very different kind of trek to Kinabalu – you probably won’t meet many other hikers on the narrow, overgrown and muddy trail. Despite its lesser elevation, Trusmadi (or ‘Trus Madi’ as it is also written) is said to offer the most beautiful dawn view in Malaysia. Why is this? It’s because Kinabalu can be seen to the north-east as the sun rises over Borneo so it really is a remarkable viewpoint well worth all the effort. In years gone by, Trusmadi was a serious expedition that required several nights of camping just to get onto the summit ridge. It has been even described as tougher than Kinabalu because of the terrain. However, since 2009 Sabah authorities have been trying to publicise Trusmadi so that more hikers visit its interesting slopes. This means that access is a lot easier now because there is a forestry road leading to within 5 kilometres of the summit. There are also plenty of signs – both maps of the area and actual distance markers every 100 metres on the trail itself. Unfortunately, you still need to request a permit from the Sabah Forestry Department at least 2 weeks in advance and a 4WD vehicle is necessary to get access to the starting point at 1,600m. You also have to take a member of Park staff with you. 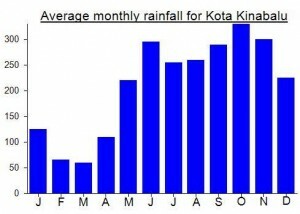 This means that, somewhat annoyingly, climbing Trusmadi can be even more expensive than climbing Kinabalu! First you need to get to Tambunan. This small town lies in the heart of the Pegalan Valley, about 2 hours drive over the scenic Crocker Range from Kota Kinabalu. From Tambunan you should already have arranged 4WD and permits to grant you access to the mountain and actually get you to the starting point. Until recently, the mountain was climbed from Kampung Kaingaran. However, the newer route means that you can start at Taman Kitingan (1,627m) which is just 4900 metres from the summit. It doesn’t sound like a lot but you will be exhausted after 5 hours of clambering over muddy logs blocking the often overgrown trail! There are lots of ascents and descents on the trail too, so it’s not as simple as gaining the 1000 metres elevation. The first section of the trail is easy and straightforward but it gets tougher near the top. One of the most interesting things about Trusmadi is the large number of critically endangered pitcher plants that grown on its overgrown summit ridge. One species is actually endemic to the mountain and is named after it. 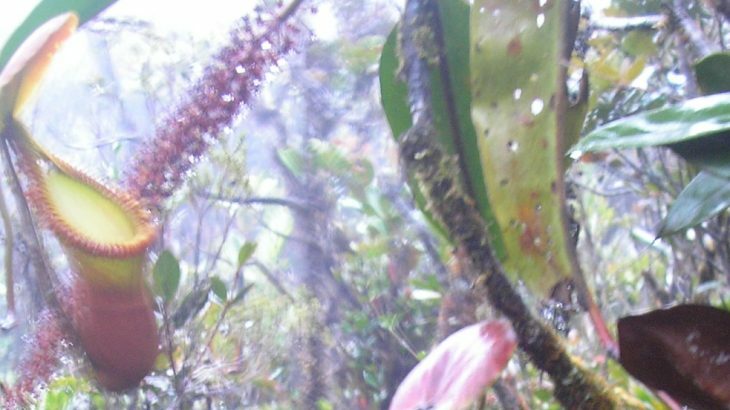 The pitcher plants are to be found from an elevation of 1,900m all the way to the summit and they get larger and larger as you get higher and higher. There are also Rafflesia in the area, but they are more likely to be seen at the foot of the mountain. In sunny weather you may well see the largest butterfly in the world – Rajah Brooke – and large leopards have occasionally been spotted by forestry rangers but only on the lower slopes. There are several rest shelters on the trail, most of which have toilet facilities and water available – after less than a kilometre you will have reached Taman Ali Hassan (1,795m), another kilometre is Taman Sulaiman (2,014m), and another 500 metres is the smaller Gombunan Hut (2,148m). After the Gombunana Hut, the trail gets a little more interesting because if you have fine weather you will be able to look along the narrow ridges of Trusmadi. The next post is called Taman Bunga (2,358m). According to the friendly ranger, this used to be a very nice spot but now all that remains is a tiny metal blue shelter the size of a doll’s house that even babies would have difficulty clambering into! This section of the trail features several aluminium ladders, not all of which are stable so take extra care. After Taman Bunga, the trail descends steeply on a narrow section of the ridge. You need to use the ropes provided. In good weather, you should be able to see the summit area ahead. There is a section here known to rangers at the Big Rock (2,391m) where you climb over a rock on an enjoyably narrow section of the ridge. About 20 minutes beyond Taman Bunga is the Gibon Cabin (2,400m), a half-finished hut complete with toilet, water, small cooking facilities and about enough space for 14 people to sleep. Unfortunately it can be a very chilly place and the sleeping places are incredibly uncomfortable even with a sleeping bag and mat. The summit is about 90 minutes further, so if you have a tent it might be better to continue up to the top and camp up there. There used to be gibbons spotted occasionally near the Gibon Cabin, but they seem to have left the area since the building was constructed. The trail between Gibon Cabin and the summit is the toughest section – lots of logs cross the trail and you need to use both your hands in many places. It can be incredibly frustrating but there are plenty of pitcher plants to keep your interest up. After an hour or more of very tedious hiking, you will reach a tower – a radio repeater. The trail turns sharp left here towards Jiran Point. Jiran Point is only a couple of metres lower than the true summit but the views of Kinabalu are said to be the finest here. 20 minutes further along the summit ridge is the true summit – Samadi Point – named after a local hunter who was the first man to climb the mountain. This area is cluttered with signs, a cement trig pillar, a Malaysian flag and a flimsy metallic structure. Hopefully the views will more than justify the somewhat hard-going trail and you will be more than rewarded. You can be back at the starting point in about 4 hours. In July 2011 it was announced that the mountain would be closed for over 12 months so that rangers could improve the quality of the trail in order to attract more hikers. Whilst some higher sections of the trail could certainly do with a bit of work, it is hoped that the potential future popularity of the mountain won’t badly affect the number of rare plant species currently thriving on its slopes. Getting there: The nearest city is Kota Kinabalu which is 2 hours drive over the Crocker Range from Tambunan. From Tambunan it’s 60-90 minutes in a 4WD to cover the 30km on forestry tracks to the start point. Accommodation: Plenty in Kota Kinabalu – both budget dorms and 5 star hotels. Limited accommodation on the outskirts of Tambunan. You can either camp at the summit (recommended) or stay at the chilly, half-constructed Gibon Cabin at 2,400m. Permits: You need to arrange it in advance. As usual there is the discriminatory policy of charging non-Malaysians a higher rate for entry. Water sources: Water is available at some of the rest areas on the trail and also at Gibon Cabin. However, it’s vital that you take enough with you incase supplies are turned off. There is a rumour that this is originally from ‘terus mati’ meaning ‘you will die’ in Malay/Indonesian, presumably referring to the difficulty of the terrain in decades gone by! However, officially it is named after a local man named Samadi who first climbed the mountain in the mid-twentieth century. Sabah (Malaysia) Tinggi Sedang. permalink. Climbed in April 2018. Did not reach the summit. Turned back after Peak 2 (800m to the summit) due to time constraints (more below). Went with a small group of Singaporeans and we found the going quite tough. We were going by the recently-opened trail from Kampong Sinua, which is 11.6km from the summit. The trail was made worse by two days of continuous rain and wind which turned most of the trail into a muddy slurry with mini waterfalls. There were also lots of fallen trees & logs. Guides say that the weather beyond Camp 2 (Khiong Point, 4.2km) is getting more unpredictable. It may also explain why we saw a lot of dried-up pitcher plants at higher elevation. Near Tambunan via 4WD, this is a well-developed trail with a boardwalk and a cabin at Taman Sulaiman. However, as of April 2018, the road to Kitingan has been wiped out by a landslide and is not accessible. So agencies are transferring climbers to Kampong Sinua. There is another trail which can be reached by 4WD from Keningau at Apin-Apin. The trailhead is quite inaccessible, but the route to the trail is described as the shortest and steepest. Those of the guides who have taken this trail have called it “extreme”. About 100km on a paved road from Keningau is the third and final trail. It was opened by Mr. Dennis Ikon in 2011-2012. He currently runs the private company (Malim Gunung) contracted by the Forest Department that operates lodging, guiding and management of the Mannan Trail. At Sinua there is a base camp: an open cabin with very basic beds for about 35, a rest hall that doubles up as a canteen and four toilets with running water. There are no places in Kampong Sinua to buy supplies, so if you want to get equipment or packaged food, try the LJ minimart at Sook (60km from Sinua) or the Giant supermarket at Keningau. The start of the trailhead from Sinua is across a bridge over a river, and there are two toilets there. The trail to Camp 2 through the forest is a fairly easy, mostly uphill 7.4km trek, with at least two river crossings. If it rains the day before or during, expect lots of mud, difficult river crossings and lots of leeches. The last 700 metres is a tricky technical climb to Camp 2 which involves clambering over logs while traversing a slope. Camp 2 has another open cabin like the one at Sinua: canvas beds, basic toilet facilities and water points (rainwater). There’s also a very basic kitchen where previous climbing groups and the guides leave excess food behind. If the weather’s good, views from Camp 2 are great. From Camp 2 it’s 4.2km to the summit. There are two peaks to surmount and then the real summit. I didn’t see any other structure after Camp 2, so it’s possible that they’ve been dismantled. There are several wooden ladders at very technical parts. The views from this trail, especially of the mountain and the surrounding area, are pretty great. There’s a short flat section of the trail just after Peak 2 where Mount Kinabalu is visible on a clear day on the right. The forests at Peak 2 are really magical, completely worth the pain of getting there. The guides will insist that groups summit and return to Camp 2 by noon latest. The reason being there’s still a 7.4km return trek to Sinua, and doing the river crossings in the dark after two days of rain can be a harrowing experience. Personally, the entire round trip from base camp to the summit and back (23km) is too much of a rush to be done within 2 days unless you’re an experienced hiker. It’ll be better to stay overnight at base camp for an extra night, so that the summit push doesn’t need to be rushed. At my group’s pace, it took us 4 hours to Camp 2 from Kampung Sinua, and 4.5 hours from Camp 2 to Peak 2. Returning, 4 hours back to Camp 2 and another 4 to Sinua. Except for the summit push, there was intermittent to heavy rain at most times. Camped overnight at Base Camp located next to the river (also known as Mirad Irad) which has wooden huts, toilet facilities, and cooking area. Set off at 12mn. It is about 20mins by 4WD to the start point. From the start point Taman Kitingan @ 4900m mark up till Taman Sulaiman @ 3000m mark there is now a boardwalk. Perhaps it was built to reduce damage to the trail, but it is also much less challenging now. At Taman Sulaiman there is also a proper manned guesthouse (with bunk beds, toilet, cooking facilities) which you can choose to stay overnight before you make your summit attempt. Beyond the boardwalk the trail is narrow but defined, and can get muddy. Not recommended to climb if it has rained recently. At a moderate pace we took 4 hours up and 3 hours down. I dont think its fair to say its RACIST. Neither can one say its UNFAIR. Charging tourists slightly more is essential to the maintenance of the local trails and ensures that the locals are able to trek well maintained trails without paying too much. Such practice is well recognized in many eco tourism based economies. Agreed that ‘racist’ is perhaps too strong a term. It is, however, discriminatory. Personally I am not in favour of differential pricing and do not regard it as something commendable. The topic is worthy of an entire thesis. One has to wonder what the justification for differential pricing is. Is it because the average foreigner is richer than the average local and should therefore contribute more (in order to pay a similar percentage of their salary)? If this is the case, it doesn’t really address the issue especially well because local millionaires, for example, can still pay the lower rate whereas backpackers from Europe who have spent years saving to make a trip to a faraway country have to spend a significant proportion of their weekly budget. Is it because the foreigner is not a local taxpayer? This would be a better justification but as several of my experiences in Indonesia indicate if you are not ‘local’, ethnically speaking, you are often encouraged to pay the higher rate even if you are a local tax payer. I expect that many would be appalled if differential pricing for entry to national parks in, say, the UK, were introduced. And rightly so – ultimately the natural world should be accessible to all (and therefore ideally free of charge wherever possible). The last major hike I did was Rinjani. As a foreigner I paid the higher rate. I didn’t mind too much about this but would have preferred to have simply given the guide a larger tip at the end instead or indeed made a voluntary contribution that felt appropriate. What was disturbing was the amount of litter left within the park area. This is of course a generalisation but local hikers almost certainly created the vast majority of this litter. Not ideal but it might not be so bad if the extra money from foreigners had been spent sending a team to clean up once a week but the reality was that the rubbish was just left there. Never has the saying ‘when in Rome do as the Romans do’ seemed so preposterous. I would argue that the differential pricing that one encounters in this part of the world serves to create divisions between different ‘types’ of people. It encourages the tired stereotypes of local people as all being poor and all foreigners as immensely wealthy, when the reality is never that simple. Personally I hope that governments in the region will do away with entrance fees altogether for national parks, in favour of offering visitors an opportunity to contribute voluntarily (perhaps online). Under such circumstances, if I could see my money was being used well, I imagine I would pay more than I do at the moment. Many thanks to pitcher plant expert Alastair Robinson for identifying the Nepenthes I photographed on this mountain as Nepenthes tentaculata and the mighty Nepenthes macrophylla. What a beast this one was! Not just because I climbed it the day after I came down from Kinabalu. Hard to give a rating to really, because it was grey by the time we got to Gibon Cabin, and the clouds didn’t lift at any point on the following day. The ranger is a lovely bloke and he was full of information about the mountain and the pitcher plants. I expect the sunrise view is fabulous, well worth the effort. Strangely there are no leeches on this mountain – no idea why this is but you certainly don’t need leech socks. If anyone else bags this mountain and gets lucky with the weather, please send us some photos of the views from the summit. For now, there are some reasonable photos here….